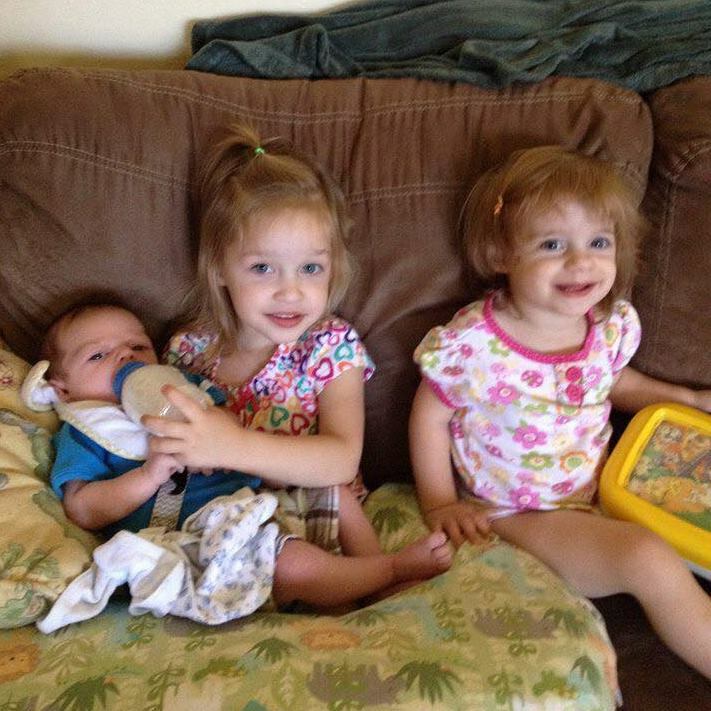 These are my three gifts from God. These are the three that Jesus are using to break off my hard edges. These are the three that bring so much joy and pain to my life. I spend a lot of my time crying. (Great start to a post…don’t worry it gets better) I wonder half the time what in heaven’s name God was thinking to give me three kids so close together. I overheard someone at church tell a mom that one of my friends was smart for spacing her children. I thought well I don’t really feel like I had a choice in the matter. Seriously, both my second and third child were not planned and are a result of one night not being careful. We were not going after having more babies. Not that we don’t want more children but I could really use a break. When Micah was born we had three under 3. We outlived them another year. I fight with the fact my house is not clean. Matter of fact, I just remembered I have food on the table I have to clean off at 1am. I have come to the point that if I can get just one thing done a day I’m doing well. Sometimes I have the ability to get an entire room cleaned up and others I’m lucky to get my one thing done. Call out to Jesus. It’s ok for the kids to see it. They need to know you are human too. You will screw up and that’s ok. Be humble and admit your mistakes to your kids. Remember you are being molded in the tantrums of your children. One day they won’t be on your lap and you will no longer have them this small. This is only a season. Read if you can find 5 or 10 minutes. Two books I love and the second one I will mention I am still reading but so far in love with it are. Mom Enough edited Tony & Karalee Reinke and the second is Give them Grace by Elyse Fitzpatrick. These two books are helping me figure out this mom thing. As two kids are screaming, my phone is ringing and my oldest just spilled her potty all over the living room, there can still be calm. I’ve found that if I can start letting the mess go and focus on my children, I do so much better. It’s not enough to be in the same room with them. It’s taking the time to sit with them and play, read, dance or whatever. Find other mom’s who will encourage you. The women in my church have been so supportive in giving me ideas, praying with me, and just loving on my babies. It really does take a village to raise your children. Just make sure you are in the right village. I’ve heard that phrase my whole life. Why do we associate this with people? Why do we use this term so we don’t have to change? Forgive me but I think that’s a bunch of nonsense. Becoming unteachable and unchangeable means nothing more than we have become “old and crusty”. I pray that I don’t become old and crusty but that I will be ever changing and heading towards my Jesus. Now Jesus is a gentleman and doesn’t make me change all at once because that would be an overwhelming suicide mission. But He gives me little bit by little bit to work on. I will continue to work until the day I walk into His arms and wake in death to the after life with Him. A lunch with friends or family at Cracker Barrel. A quiet afternoon floating in the pool. Back to back (to back to back to back, etc) episodes of NCIS. A 64oz cup of Coke (or later, Sprite) filled to the brim with ice. A Florida Gators or a Miami Dolphins football game. Getting your nails painted and your hair colored. These were just few of your favorite things. The family trip to Lake Tahoe. Seeing the birth of both of your granddaughters. Watching all your kids graduate high school. Every time your tumor markers went down. When you heard one of your kids (or your husband) come home. When we sung of His faithfulness at church. No longer held in a body wrecked by horrible pain. Being able to run, breathe, jump, shout, and dance. Seeing clearly with no need of contacts or glasses. These are just few of your favorite things. Seeing your dad, brother, and sister again. Meeting the child, the one before me, who died in your womb for the first time. Receiving the crown that was laid up for you for a race well ran. Seeing the worship in the throne room with your eyes, no longer just a vision. Casting your crown at His feet and worshiping with the multitudes. Being overwhelmed with light and love all while being in His presence. One thing overshadows them all…. Seeing Jesus, the One you loved for decades, face-to-face. This is your favorite thing. Because I’ll be there, with you, one day too. Until then mom, Happy Mother’s Day. I started stating my goals on this blog last year. I liked the motivation and accountability it gave me so I decided to do it again. I changed most of my goals this year. I feel it’s really important to have changing goals every year. If our goals don’t change, then we either aren’t reaching high enough or not trying hard enough. All of my goals last year are ones I will continue to do. These goals are more about building habits and long-term practices in my life, instead of just being things I do for only twelve months. This past year, I have realized that I’m quite a polarizing person. Most people either like me or hate me. Very few are in the middle, and they are usually drifting to one of those two sides. There are things I do that turn people off to me, and I don’t even notice it. It’s clear on their faces and in their body language, but I don’t see it. It’s time I learn those things and learn how to curb the negative polarizing side of me. My work leadership is taking the charge in this (per my request and their knowledge of it) since many of these things exist in my workplace. It will be a good testing floor for my progress. Since leadership is about buy-in, listening, trust, and team, I must learn these things and make them a natural part of my life. I’m sure there are many core things in my heart (like rejection issues from 20 years ago) that I will have to face, but God is good and sovereign. He will cause me to come out of this acting more like Christ. Las year, I wanted to grow theologically, meaning “knowledge”. I felt I didn’t do that well enough or at least not intentionally enough. This year I plan on starting actual ministry schooling through my church through the Global Church Learning Center. I’m excited to begin working on my BA-E. I’m sure it will be a lot of work but I’m grateful that I won’t be just learning knowledge, but also how to apply it and how to network. I also desire to continue reading deeper theological books. I want to read my first systematic theology book this year. I really want to read Wanye Grudem’s Systematic Theology or the one written by John Frame. I also want to read a longer and deep book on some theological point. Currently I’m looking at reading (the brand new) From Heaven He Came and Sought Her: Definite Atonement in Historical, Biblical, Theological, and Pastoral Perspective. I’m also excited to buy my first commentary next year. I’m looking forward to studying the Bible deeper than I ever have next year. Last year was the first year that I didn’t have “write new songs” on my list of goals, and I didn’t write any (although I wrote parts of a few). I could go another year without writing. I’m not going to lie, writing songs for my church is one of the hardest things I do, yet one of the most rewarding. I decided that I wanted to focus on writing this year. I want there to be a set time every week that I write for a couple hours or so. I feel that is achievable with my busy schedule. However, I want to focus on what kind of songs I want to write. By the end of the year, I want to have written 2-3 songs that are melodic and memorable that my church loves to sing, while keeping the lyrical content fresh and highly theological and scriptural. I want to write songs that help people engage in worship but will also encourage them. It is my experience that most of our church members don’t fully engage in worship with traditional Christmas carols. I think that they may be too seasonal and familiar. I want to write songs this year for Advent 2014. Whether these songs are used in a Christmas production or just as worship songs during that season, I think it would help our church to have more Christmas songs that they can use to engage with God. Currently, the worship ministry is planning on doing a songwriting workshop in the summer and also participating in the local (original song) music festival in November. I think these are going to be great helps and motivations for me to pursue songwriting with more focus and care than I have ever given it. My wife will love this one. Thanks to some medical problems in 2013, I’ve lost almost 40 pounds, yet it will be easy to put it back on. After what I’m sure is years of my wife praying, I feel the Lord moving me to take better care of my body, so that I can do all He has called me to do with my family, work, and church. Currently, I am planning on getting a few friends to join me and read/work through Rick Warren’s new book, The Daniel Plan. I have heard great things about it and I think it will be a good place to start. Thanks to the medical issues I’ve had, my diet has changed a good bit, but it needs to change more and I need to be more active. These are the two big things I look at changing early in the year. I have the honor today of delivering my mother’s eulogy, to speak words about her life and help memories of her shine a little bit brighter. This is a daunting task. In thinking over her life, I wondered “how can I condense this woman’s spectacular life into just a few minutes of speech?” There’s no way I can do that justice. It would take me days to recount and talk about all her years. So rather than try to give a blanket summary, I’ve decided to focus on what defined my mom’s life: suffering. Anyone who knew my mom, even for a few minutes, understood that she suffered in multiple ways for decades. And while many here know some of the sufferings she went through, most have not known all of them, the reason why she suffered, or what was birthed because she suffered. This is what I want to talk about today. Bambi Linn Ostendorf was born December 19th, 1958 at Charleston General Hospital in West Virginia. She was a funny kid who was always joking around. If you ever wonder where we, her children, got our humor from, now you know. She went through school and soon after graduating high school married a man named Gordon Tucker. They were married a few years before they achieved perfection: me. Just kidding. (Hey, I wrote the eulogy so I thought I’d embellish it a little bit…) Everything was good. They served at their local church, Trinity Assembly of God in Deltona. He was an usher and she was in the choir. Several years later they had Andrew and 20 months after him came Phillip. Three beautiful boys. The night they came home with Phillip, Gordon looked at Bambi, denied any love for her, and walked out the door, divorcing her. This event changed her. It broke her. Everything she had trusted in, relied in, hoped in, seemed to crumble. The dreams she had of having a nice life, in a house with a good family was slipping from her fingers like how water does when you try to hold it. She didn’t give up. She mustered up strength, went back to college, and worked her hardest to get her life back on track. August 1991. Almost exactly one year after the divorce. Between school life and work life and home life, she squeeze in her scheduled mammogram and found out…she had breast cancer. God was merciful and gave her grace to overcome all her doubts, depression, questions, bitterness, and the like. She entered into remission and life seemed to be getting better, or at least a little more stable. I want to stop for a moment and say something. We are here today to celebrate and remember my mom, Bambi, but we honor her the most by stopping and honoring her husband Richard. Dad, I have watched you over the years take care of mom. The countless days and nights where she couldn’t get out of bed because of pain. You never left. When you promised to be with her “in sickness and in health”, you kept your word. Were you perfect? No. But did you love her and serve her till the end? YES. And I want to say to you as her son, but also now as a husband and father myself: thank you so much for everything you did. You have given me (as well as our church) a shining example of what it looks like for a husband to love and serve his wife. I want to stand today and applaud you for all your sacrifice. And I would ask all here to join me right now in honoring him. Richard was great. He married Bambi, legally adopted us boys as his own, and then together they had two beautiful miracles: Reagan and Shelby. I say miracles because the doctors told mom that she should abort the twins. The chemo had ruined any chance for the girls to come out healthy and normal. But mom (along with dad) believed God and God was faithful to bring them forth with no issues. For the next four years, Bambi would work as a home-health nurse. All those years of schooling while dealing with divorce and cancer seemed to be paying off. Times were good. We were having fun as a family. We as kids were constantly finding reasons to have our babysitters call 911. Life was normal again. When most people are asked what Bambi’s greatest trial and suffering was, they without a second thought say “cancer”. And while cancer certain caused my mom great discomfort and pain, it took a far second place to that fateful morning on August 16, 1996..
Bambi was in Debary working, on her way to the doctors for an appointment before continuing the rest of her home health work, when another car turned in front of her and caused her to collide going over 40 miles per hours. Her dark green Dodge Shadow compacted to half it’s size. By the time Richard got there she was already in the ambulance in excruciating pain. It would be years before the doctors would realize she had muscle fibermilalga. My mom lived in constant pain from that moment to the day she died. The medication she had to take since that day was immense and it was usually just enough to help her get out of bed. Everyday was a waking nightmare of pain. But as she was laying in the ambulance, waiting to be taken to the hospital, she heard God speak to her one of the clearest phrases she has ever heard from God: “I am going to give you plenty of time to seek Me.” What would you do if you were in intense pain everyday? Bambi could of gave up. She could no longer work. She could barely get out of bed. She had (at the time) no quality of life. She could of dwelt in continual depression and become psychotic. She could of became bitter and offended with people and with God. Rather, and what makes her truly great in my book, is that she took her pain and used it to draw closer to God. This began a season of seeking God that I have rarely seen in anybody else. She devoured everything she could concerning God. I have fond memories of every week or two going to Family Christian Bookstore in Daytona and every time leaving with a $300-400 receipt from books and worship cds. She bought every videotape the Brownsville Revival had to offer at that time. I told dad the other day that if it wasn’t for that season in her life of consuming the Bible and devoting herself to the spiritual disciplines, none of us kids would be where we are, serving the church as we do. And it all stemmed from the car accident. Though she could no longer work, she started seeking God, asking Him what she could do. She became a youth worker and sunday school teacher. She then started and ran a hospitality ministry for our church. She was known as the “milk cake lady”. It wasn’t just baking for her, it was ministry. She started sewing again. She had learned sewing from her mother, Joann, and even used to make her own clothes. She sowed flags for church worship. (That got her the name of “banner lady”) She sowed handkerchiefs. She sowed bandannas. But her most memorable things she sewed were her quilts. God would give her a picture of a quilt and she would go and make it, often praying over every stitch. Every quilt had its meaning and while mom did occasionally have dreams of starting a business and selling them…she often gave them away for free. Again, it was a ministry for her. She felt called to minister to women who were troubled, abused, forgotten, wayward, or hurt. She would talk to them, invite them over for tea (all the 5000 kinds that she had), share with them her story, pray for them, and often send them away with a present. I can’t count how many times I would hear her say “God woke me up to pray for someone last night and gave me a picture of a quilt for them. I need to go to Joann Fabrics and get the material.” Our $400 bookstore bill became a $400 fabric bill. She loved it. She loved being able to spend hours in prayer, talking to God, making these symbols of love. She would spend years like this. Loving, serving, sewing, baking, praying. That’s who she was. During this time, she had learned to rest in God, to be just a child with her Father. In August 2006, the family went down to Ft Lauderdale for a mini-vacation. For whatever reason, she decided to go jet-skiing. But as she was riding, she noticed that something was wrong. She went to the hospital and found out that the cancer was back and had eaten and disintegrated her entire right hip. At this point, she had been in remission for almost 15 years. But the cancer came back in force. She would spend the next 8 years fighting it, with rounds and rounds of chemo and other types of treatment. She was close to death many times and the church would pray and God would bring her back from the brink. Finally, the cancer moved into her brain and lungs, which led to her death on December 12th, 2013. We humans are fickle creatures. We spend all our lives dressing up, decorating, and improving our “jars of clay.” We make them so ornate on the outside thinking that we are helping show people the beauty of Christ. But all people see is the beauty of us. The only way for people to see the treasure inside the jar is to crack it, to break it. The less attractive and put-together the jar is, the more people see the treasure inside it. My mom was a very broken jar of clay. The treasure of Christ and the revelation from His Word that dwelt inside of her was great, and the more broken she became, the more we had the privilege of beholding the beauty of Christ in her life. She told Richard one day that if she had the chance to stop the car accident and live pain-free for the rest of her life, she wouldn’t do it…because of how it brought her closer to Jesus. She could of fought the breaking. She could of resisted the suffering. Rather, she embraced it. So while she believed that God could heal her completely, she also knew that He had a plan, a plan for her good, a plan for her completeness. So she embraced her suffering. She boasted of her weakness. In the end, Bambi didn’t die because cancer was strong. Rather, she died because she made herself intentionally weak. She knew the more that death was manifested in her body, the more that life would flow out into others. I remember the last time she spoke publicly here at a ladies meeting. She had just found out she had brain cancer (which she knew was fatal). She sat right here. With a clouded mind, and stammering lips, she looked at the women who were there, and with shocking authority questioned them “If I can trust God with a tumor in my head that could paralyze me, can’t you trust God for your kids, your life, your marriage, your finances?” She should declare in her rock-solid faith, “In all the cancer and trials…I am only suffering light momentary afflictions. There’s an eternal weight of glory if I wait.” The more her “jar” broke apart, the more real and precious the treasure of Christ inside her became. She had one desire: to see the Lord. Not just to see Him in things (like in nature or in circumstances), but to see Him with her physical eyes, like Moses did. It wasn’t enough for her to come to church and have a nice life with a good family. She wanted God more than anything (though I must admit, a Coke and a good NCIS episode was next on the list). She longed for God and it was all the suffering in her life that cause Bambi to cling to Him. As I end, I recently found a letter that mom wrote many years ago. I found it in one of her many journals and notepads. I don’t know when it was written or who it was written for or even why it was written. It was probably written 10-15 years ago, but the words ring true, and I think it would be just like Bambi to give us another small piece of treasure today. Why? Why me? Have you ever asked those questions of God? Have you ever gotten an answer? If you are like me, you’ve not gotten one when you’ve asked possibly because we weren’t ready to accept the answer. For me, one time sticks out more than the most. It was the fall of 1991. I was a 32-year-old single mother of three young boys attending Daytona Beach Community College working toward obtaining my nursing degree. I had seen my marriage come to an abrupt and painful end the year before and was trying to put the pieces of my life back together again. As if that wasn’t enough to cope with, I had been diagnosed with breast cancer approximately three months earlier. I had a lumpectomy between semesters and then started chemo and radiation treatments along with a new seventeen credit-hour semester. I had always prided myself with being strong and being able to withstand things that would break others, but the successive blows were starting to wear me down. This morning in particular was difficult. I was sick from chemo, tired from radiation, and stressed from school. As I was combing my hair, large amounts were coming out. That seemed to be the last straw. In tears, I looked upwards and said in a very frustrated and angry tone: “Haven’t I been through enough? What more do you want?” I received no answer, audible or otherwise, just the same quiet comfort that I sensed during the long nights over the past one and a half years. Approximately two and a half years later I was working as a home health nurse specializing in peds and oncology. I had completed school, was in remission, had remarried, and was now the mother of three boys and twin girls. Life was stressful but without painful crises. One of my patients was a 21-year-old IV drug abuser dying of AIDS. She was angry, non-compliant, and unrealistic as to her prognosis. My job was to provide medical care and to instruct on ways to prolong her life through compliance. She was proving to be a very difficult patient. On this particular morning I came to her home with the intention of administering the meds that were ordered and go on with what was to be a very busy day. She didn’t answer the door as usual but it was unlocked. I came in to find her sitting on the couch practically hysterical. Her long brown hair was tangled in a brush and clumps of hair were in her hands. Immediately all my frustrations with her disappeared. It wasn’t so long that I had forgotten the trauma of loosing my hair. For the next two hours I sat and held her and soothed her as I would have one of my own children. I eventually got around to the medical care that I was there to give, but not until her hair was combed, we had talked about wigs, and she was able to smile and laugh. As I closed the door behind me that morning I clearly heard the voice of the Lord answer the question that I had angrily asked Him years earlier. He said it was because of her. Because Jesus desired to love her where she was and in the way she needed to be loved. Without having experienced that pain myself, I would have never been able to show the compassion that Jesus wanted to show her. She didn’t need a tract, she didn’t need a message, she needed Jesus with skin on. Ten years later I’m finding myself asking some of the same questions. However this time I’m not priding myself on how strong I am but learning to love the weakness that God’s dealings can bring in one’s life. 2 Corinthians 12:9 speaks of a weakness (a frailty, a feebleness) that makes room for divine power, a miracle itself. I find it to be a great mystery why the Creator of the universe would not only love me enough to give His only Son for my eternal life, but that this same sovereign God would desire to use me as an instrument of His love to a hurting world. Jeremiah 23:11 says that He knows the plans He has for you. They are plans for good, not bad. They are plans to give you a hope and a future. God proved His love for us forever as His Son willingly gave His life for us at Calvary 2000 years ago. Today, He offers us abundant life and the opportunity to be His hands extended. It’s not an easy call. My mom had two final requests for when she passed. First she asked that Renee Modica would not try to resurrect her, and the second is that we would worship God passionately. So as the worship team is coming up, my sister Shelby will come and give us a call to worship. Thank you. You can watch the memorial service here. As the year winds down, I like to look at the year that’s past and see how I did on the goals I made. I don’t know if anyone achieves their goals 100%, but I find the goal to be completed if I have made significant and lasting progress towards it. I felt I’ve handled this ok, but not well enough. Different beliefs (particularly those mentioned in the post) have solidified more since last year, but not because of ardent study on my part. That’s what I’m not happy about and I plan to change next year in a significant way. These are some of the books I’ve read and enjoyed. I’m in the middle of a few more now although I haven’t read that much in the last month or two. I need to take my own advice and read 10 minutes before going to bed. If I wrote no other post than Jeremiah & Judgment I would have been happy this year. I also started a new series called Rethink that has been received favorably. I haven’t written too much but I’m happy with what I have written this year. I’m also super excited that my wife started writing this year! This is a hard one for me to evaluate but I feel like I have significantly grown as a leader, even though the beginning of the year was rough. Yet, because of these experiences, books I’ve read, and situations that I’ve dealt with, I been able to grow more into the leader that I see in the Sermon on the Mount. Due to some issues, I wasn’t able to take the leadership course at work this year (though in hindsight, I count this as a blessing). This year has been extremely taxing on our little family, but I thank God that He has helped me lead us through it well enough so far. I have much more ground to cover on this one, and I look forward to what is to come this next year.